We have been asked, as we often are, to test some trade mining software for various trading instruments and whilst we are still reviewing the software we thought it would be a good idea to use the software to identify some trades for the month of May so we can ‘test’ the actual performance of the mined trades. We were given an option to mine stock, forex and future data and whilst we chose to look at both forex and futures I think for the review we will be using the forex miner. Not only are most of our followers forex traders but I think the symbols that are thrown up for the forex trades most people have access too whether it is on MT4 or NinjaTrader. However, it is worth noting that with the mining software you can select which symbol you want to mine so if you are only interested in one you can focus purely on that. We will have more on the functions of the software when we complete our review. 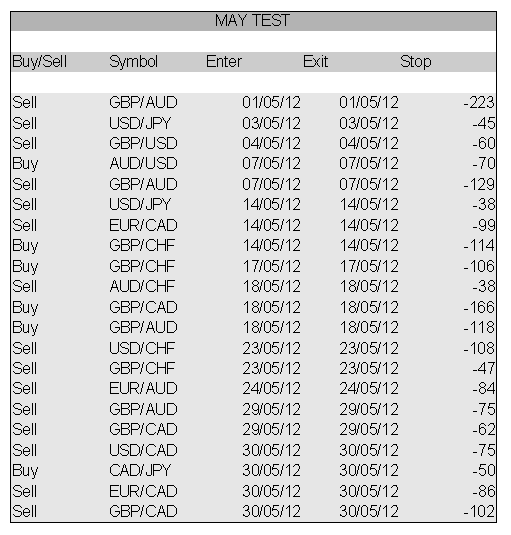 Below is the list of forex trades for May 2012. The selection criteria for the trade mining was that trades were 85% successful, that more than 5 years of data were considered. Again, we will explain more about this at the end of the test period. So the following trades were thrown out and, all bar one which was dismissed as not being good enough, were included. As you can see it we have displayed the results for your in a table, however the results in the software come with a lot more information. For this transparent test we have included the symbol, the trade direction, and a suggested stop value. It is worth noting that all these trades are 1 day trades. This was another of our selection criteria and chosen purely because it keeps all trades the same length and can do one check at end of day for the results. I should also highlight that the mining software does not really come with a definitive on what to do with the information. Suggestions to open trade at the days open and close at the close is based purely on the fact that is the period from which data is analysed. So we will be looking at two things. Absolute results of opening at the start of the day and closing a trade at the end of day with the suggested stop and also whether the day was a general buy,sell, neutral day. There are so many things to think about when using data to trade and it is a trading method GTS quites likes on the whole and we will address many of these thoughts in the review after the test in may. I should also mention that the test DOES NOT include us using real money to trade these trades. I also would suggest you do not trade based on these predictions. This is a test for a very good reason and although as tempting as it is to jump in a trade them live it is not a good idea. To be the best trader you will need experience,experienced people to help you out and the best tools to make your work efficient and easier. Good software is essential in trading.A trader must choose the right tools for his or her needs. If you opened these trades at the beginning of the day and closed at the end you would have made about 45 pips or so for the month – your spread so you would be lucky if you broke even following this. First I would suggest that that is not really how you should trade i.e open at beginning of the day and close at the end. And certainly not if your data mine test doesn’t suggest trading that way is profitable. If you wanted to trade like that I think you would have to be looking at binaries or options but personally I would always close trades intra-day. I don’t think I have come across a day trading system that couldn’t be made better from closing intra-day. I would also suggest that a month where you are lucky if your broke even is something you will have to get use to if you are to be a full time trader. If you can’t accept thatwait until you have a losing month. Its a whole different ball game.